Wilmer Sifontes (maracas), Diego la Verde (harp), and Jose "Chebeto" Requena (cuatro) entertain visitors to the Venezuelan stand at the World Travel Market in Excel, London. The Venezuelan Tourism Board, Inatur, set out its stall today at one of the largest tourism fairs in the world, the World Travel Market, which is taking place at the Excel Centre in London until Thursday 10 November. 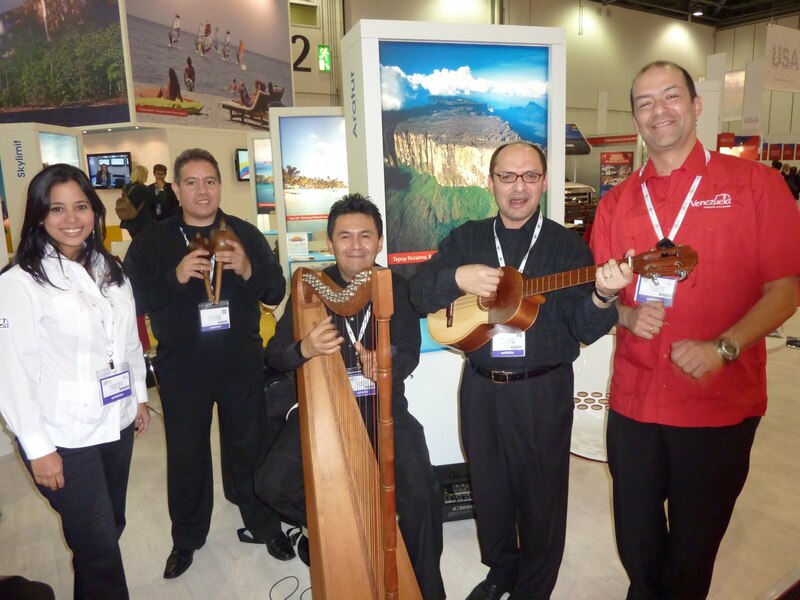 To the joyful sounds of harp, maracas and cuatro, visitors to the Venezuelan stand were treated to giant photos of some of the country's top travel destinations, including Angel Falls, Margarita Island and Los Roques. Manning the stalls and hoping to drum up new business for Venezuela's tourism industry were the Merida-based tour operator Natoura Travel and Adventure Tours, Anke Nöthling from the Cacao Travel Group and representatives from the Venetur chain of state-run hotels. To give visitors a flavour of the country, snacks in the form of canapes made from fried plantains topped with cheese or shredded chicken, and empanaditas, were supplied by Mi Cocina es Tuya, a Venezuelan restaurant in Crystal Palace. The biggest surprise of the first day was an impromptu appearance by the newly-crowned Miss World, Ivian Sarcos, who brought an extra touch of glitz and glamour to the event. Alexis Pulido of Mi Cocina es Tuya with Venezuelan beauty Ivian Sarcos, the new Miss World. Photo courtesy of Robert Ramos. Arriba Venezuela!!! A dar la cara por nuestro pais, demostrando que si podemos surgir. Muchas Felicidades a Miss Mundo, no sabes cuanta felicidad nos haz traído a los corazones venezolanos. Una recomendación a nuestra bella Ivian Sarcos, seria que entre sus planes de futuro incluyera aprender el ingles, ya que fue lamentablemente criticada por ello durante el certamen Miss Mundo… no esta demás tener estas habilidades porque ya hoy en día es un requisito esencial para establecer comunicación a nivel mundial. Y aquellos que todos los dias nos levantamos con una meta mas en la agenda para dar la cara por el pais mas bello del mundo.